May | 2009 | Uninstall it! I waited for a long time to play with DeviceKit-disks (DeviceKit-disks is a rather interesting daemon that allows developers to not clutter their code with format related stuff) and now this week I had time to start working on KFormat. 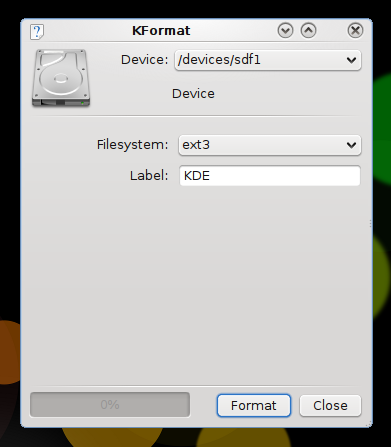 The idea behind KFormat is to replace KFloppy then the next step will be to implement KDiskManager and a KDE disk management library. The first revision of KFormat is now under development in KDE svn and I will blog when I’ll have more interesting updates.